DRE MUZIK GROUP is bringing a "Def Jam Ultimate Showcase - Florida Edition" to Sarasota, Florida. 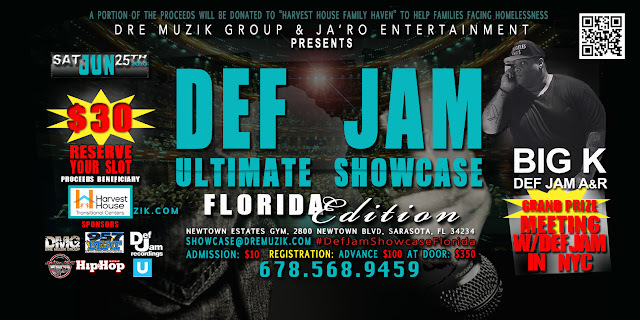 DMG's premiere event called, “Def Jam Indie Showcase Florida” will take place Saturday, June 25, 2016 at Newtown Estates Recreational Center, 2800 Newtown Blvd, Sarasota, FL 34234. The doors will open at 1:00 pm for registrars signing in and the show will begin promptly at 2:00 pm. The event will offer real promotional opportunities to young entertainers pursuing a career in music all while raising money to help families going thru crisis and are in need. For instance, a free Artist Development Class will be offered to discuss how the showcase will be judged, ways to impress the judges, and disclose tools available to help independent artists. Also, DJ Shizm from Clear Channels, Tampa Bay 95.7 The BEAT will provide the sounds and host the showcase's compilation mixtape. Furthermore, a Senior A&R from the major record label, Def Jam Recordings who is in charge of scouting talent for them will judge the performers. In addition, the grand prize will be a private listening session in New York with the Vice President of the record label. To close out the evening, we will announce the amount of proceeds that will be donated to the “Harvest House Family Haven” Program to benefit families facing homelessness. Artists must register early to take advantage of the artist development classes; and those skills to be successful in the music industry need to be in the building for this showcase. Our goal is to raise enough proceeds to make donations and offer a first place grand prize trip for a meeting with the vice president of Def Jam Recordings in New York. Additional prizes will include free studio time, music video, photo shoots, featured articles in magazines, website design, and mixtape hosting. Prizes will be awarded to the best performing artists at the end of the event. A recent survey, complied by local Sarasota service providers, stated over 350 families with 1000+ children and youth were reported homeless in Sarasota County. Harvest House is on a mission to end homelessness among all families. On October 1, 2014, the Harvest House Family Haven was opened to provide emergency housing and case management to families in a housing crisis. We need your help to provide resources for families to get off the streets, out of their cars and into a stable and safe environment where both parent and child can thrive. Your donations provide the funds necessary to house, clothe and feed homeless families, as well as to provide necessary case management services. Scholarships ensure that each family is put on the right track to success from the very beginning. Each family will be given the best opportunity to establish a foundation they can build on for many years to come. To get involved with the initiative, the Director of Development can be contacted at (941) 685-4047. Harvest House Transitional Centers is a subsidiary of Harvest Tabernacle of Sarasota, Inc. Harvest Tabernacle of Sarasota, Inc. is a not-for-profit 501(c)(3) organization registered with the State of Florida (CH39598). DRE MUZIK GROUP is an independent record label out of Atlanta, GA founded by Sarasota native Rene Mosley. The company offers services including concert promotions, club promotions, celebrity bookings, finding gigs for independent artists, brand management, artist development, photography, music video, promotional videos, graphic designs, website designs, T-shirt printing, Flyer printing, CD duplications, and event planning. Def Jam Recordings was founded by Russell Simmons and Rick Rubin is now owned by Universal Music Group. Def Jam’s current roster includes artists such as August Alsina, Big Sean, 2 Chainz, Kanye West, Jeezy, Young Thug and Justin Bieber to name a few. Karen Roulette known as Big K is a Senior Representative from the artists and repertoire (AnR) division at Def Jam Recordings and is responsible for talent scouting and overseeing the artistic development of recording artists and songwriters. For additional information, contact Rene Mosley at info@dremuzik.com or phone# (678) 568-9459.